Don’t Call Me Dave congratulates new Conservative MP for Hendon Matthew Offord on his victory at the General Election. 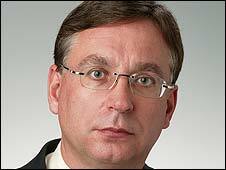 The margin of victory was slight - just 106 votes - and defeated Labour candidate Andrew Dismore, pictured hard left, is threatening legal action to try and overturn the result. In a bad tempered speech, described by the Barnet Times as “vitriolic”, Mr Dismore accused the Conservatives of dirty tricks. It really does not behove someone from the party which includes Lord Mandleson as a senior member, to make such an accusation. The bottom line is this Mr Dismore. The margin of victory might be small but 57.9% of the electorate made it clear that they didn’t want you. Given your outrageous allowance claims and your despicable stance towards the Gurkas, it is no wonder you lost. Your party are new converts to PR so accept the decision and go and find yourself a new job. Preferably one which doesn’t involve sponging of the taxpayer.